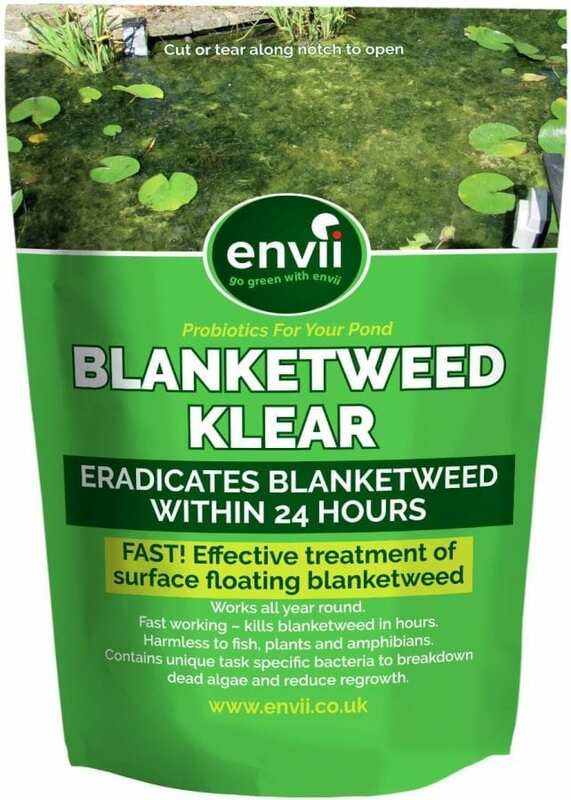 Immediate Blanket Weed Treatment for Ponds! Blanket weed is the devil reincarnated and unfortunately, he has chosen your pond as his next victim. It grows extremely fast, requires very little to thrive and before you know it, the surface of your pond is taken over by the thick stringy weed. Not only very hard to get rid, but also poses a danger to your fish, aquatic plants and wildlife. Which is why it is very important to choose a blanket weed treatment that works quickly and safely. Luckily for you, Blanketweed Klear is blanket weeds kryptonite. Using oxygen, Blanketweed Klear instantly kills floating blanket weed and will have completely killed it within 24 hours. Blanketweed Klear kills algae that is floating on top of the water. For submerged algae that is attached to plants, pumps or the side of the pond, you need Algae Klear Xtra. This algae is commonly known as string algae and is regularly confused with blanket weed. 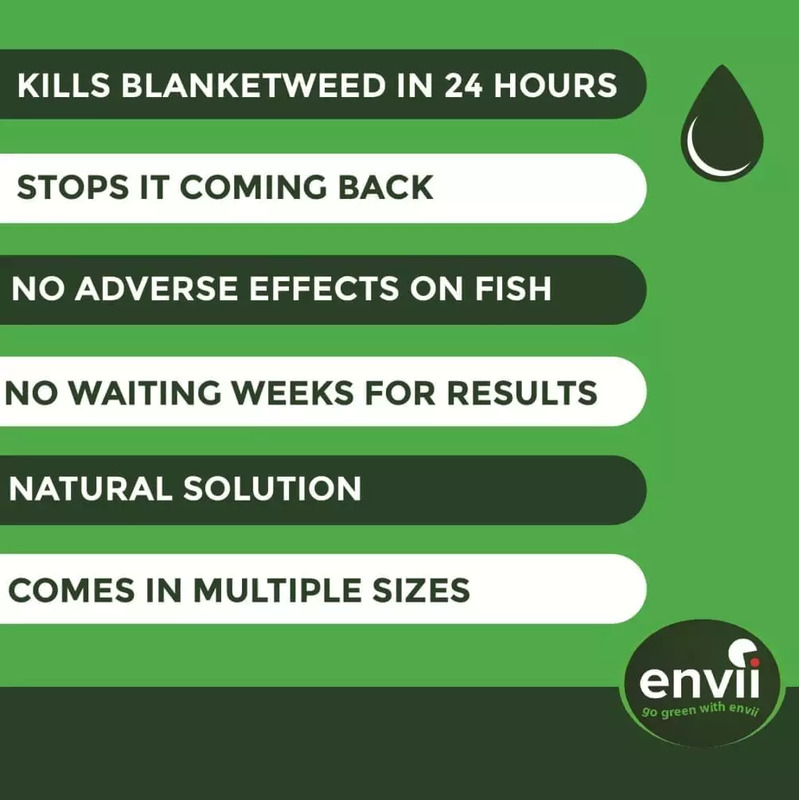 For more information about blanket weed and to determine which algae you have, read our Ultimate Guide To Blanket Weed! Temperatures in the UK can fluctuate massively, we all know this as we love to talk about it. However, this makes treating a pond quite difficult as some products only work down to certain temperatures. Once they reach this temperature, they stop working, allowing blanket weed to strengthen again. We have incorporated innovative bacteria into our treatment that allow works down to 4°C. Perfect as blanket weed stops growing below 8°C, we’ve got you covered all year! 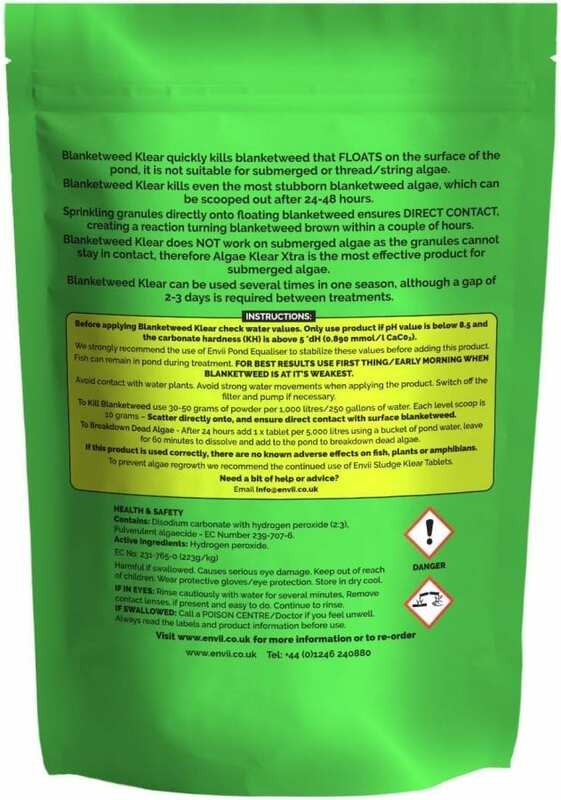 You can also rest assured that your fish, plants and wildlife will be completely safe when using Blanketweed Klear. As the oxygen we mentioned before it used in the treatment. How to Prevent Blanket Weed in Ponds? You’ve gone to all that effort to kill the blanket weed only for it to come back two weeks later. What a waste of time and money! That’s why we include bacterial follow up tablets in with our blanket weed treatment to prevent any new blanket weed growth. By suppressing the blanket weeds food source, a biologically balanced ecosystem in your pond is created. This acts as a natural defence against blanketweed and other algae. Learn more about blanket weed to help you in the fight against evil! From what it looks like, how it can be dangerous to your fish and most importantly, how to get rid of it. Before using, we recommend checking your water parameters and ensuring your pH is below 8.5 and KH is around 5. You can do this by using a test kit or applying Pond Equaliser, to instantly stabilise the water parameters. If the powder meets aquatic plants such as lilies, it may cause some temporary discolouration on foliage. For ongoing maintenance and to protect your pond from future algae and blanket weed, use Pond Klear or Pond Klear Xtra. These help to keep bacterial levels topped up and the natural defence system strong. Use Blanketweed Klear first thing in the morning as this is when algae is at its weakest due to being deprived of sunlight overnight. What algae does this work on? Will this kill pond plants? Blanketweed Klear won't kill pond plants but can cause temporary discoloration if applied directly. Will this harm my fish? No, it is safe for fish and will improve their health by increasing the oxygen levels in the water. If after 24 hours the algae has not turned brown, repeat. Pond water treatment that targets three known problem areas in ponds, green water, sludge and nitrate levels, which are usually the cause of green water or algae. Contains 1L of Pond Klear Xtra, 6 Sludge Klear tablets & 6 Nitrate Klear tablets.